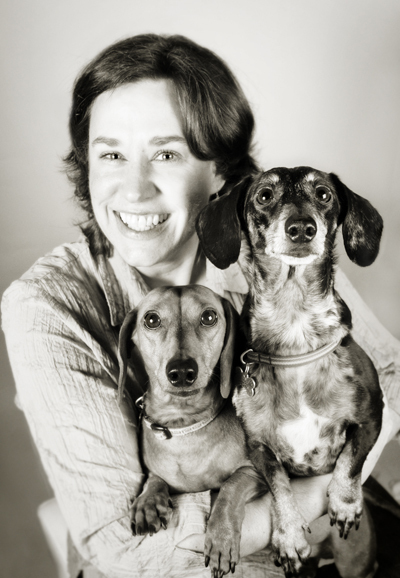 Today we welcome the premier Northwest dog writer, Val Mallinson, to the blog. If it’s in Washington, Oregon or parts of British Columbia and you can take your dog there, she knows about it. Her books are very handy guides for discovering new and different places to take your furry friends. How many dogs do you have, what are their names and breeds? Val: I have two smooth coat, miniature dachshunds, Cooper and Isis. Both are rescues and collectively known as “The Wonder Wieners.” But, I like to tell people I wrote the book from the perspective of a large, sloppy chocolate Lab, which I’m convinced I was in a former life. How many Dog Lover Companion books have you written? Val: There are three: The Dog Lover’s Companion to the Pacific Northwest, which covers Washington and Oregon from the mountains to the coast and a little bit of British Columbia; The Dog Lover’s Companion to Seattle, which extends from Everett to Olympia and the islands to Issaquah; and The Dog Lover’s Companion to Oregon, which covers, um, Oregon. The books are so thorough. How long does it take you to write one? Val: The first book took two years, full time and then some, from contract to cover. The latest edition, updated in 2009, took about nine months, like a birth – sometimes as uncomfortable as a pregnancy, almost as rewarding. Do you actually visit all the places you talk about in the book? Val: Yes, M’am. Our collective 10 legs, six eyes, and three bodies (sometimes four bodies, if the husband came) have visited every single spot we wrote about. In Washington State, what are your favorite places to take dogs? Val: Our favorite place is always the most recent one we’ve visited! One thing I like about the books is that there’s a “Pick of the Litter” at the beginning of each chapter, giving you the highlights of each region. If forced to choose, I’d have to start with water: Whidbey Island. The dog parks and beaches are great (Double Bluff Beach!!! ), the people are so friendly, the picnic food is superb, and it’s so close to Seattle, yet seems a world apart. Second on the list would be mountains: Bellingham/Mt. Baker. Cooper loves a good hike in the woods or around Lake Whatcom on the Hertz Trail. Old Fairhaven has charm, delicious food and great shops and you can take well-behaved pets into most of the boutiques along the four blocks. Finally, Lake Chelan has really captured our interest lately, for the water, mountains, sunny blue skies and (slurp) up-and-coming wine scene. Page 357 of The Dog Lover’s Companion to the Pacific Northwest (TDLCPN) lists seven fabulous wineries where pets are welcome to hang out with you on patios while you wine and dine. Which lodging facilities in Washington are the most accommodating to dogs? Val: Some wonderful spots go out of their way to be as friendly as a Golden Retriever. To name a few, Willows Lodge in Woodinville is the tops; they even have a dog greeter in the lobby. In Seattle, the W Hotel puts the “W” in tail-wagging; they often host Mutt Mixer parties along with CityDog Magazine, and they have a pet package at check-in. For upscale hotels, try Starwood Hotels . I tell you what, on the cheap, you can’t beat Motel 6—they are reliably dog-friendly, conveniently located, and their website lists all the locations that have recently been updated and overhauled to look quite nice. What is Washington’s best-kept dog-secret? Val: If I told you, I’d have to ki—no wait, different job. Okay, if I’m a dog, I’m going to recommend the ends of the earth at Cape Disappointment State Park on Long Beach Peninsula. The beaches are endless, the hikes are wooded, you often have the place to yourself, and the food and lodging are constantly improving. Hint: Try the Inn at Discovery Coast. Or Guemes Island, page 48 in TDLCPN, but you really have to want to get away from it all. This entry was posted in Dog-friendly, Guest Posts, Hotels and Other Lodging, Wineries and tagged Bellingham, British Columbia, Cape Disappointment State Park, chocolate Lab, CityDog Magazine, Dog Lover's Companion, dogs, Double Bluff Beach, Golden Retriever, Guemes Island, Hertz Trail, Inn at Discovery Coast, Lake Chelan, Lake Whatcom, Long Beach Peninsula, miniature dachshunds, Motel 6, mountains, Mt. Baker, Mutt Mixer, Old Fairhaven, Oregon, pet package, pets, Seattle, Starwood Hotels, The Dog Lover's Companion to Oregon, The Dog Lover's Companion to Seattle, The Dog Lover's Companion to the Pacific Northwest, Val Mallinson, W Hotel, Washington, Whidbey Island, Willows Lodge, wineries, Woodinville on October 18, 2010 by Heather Larson.